MasterShield Gutter Guards prevent any debris, no matter how small, from entering your gutters, eliminating the risk of overflowing gutters and water damage to your home. MasterShield ATL can help you eliminate these problems with gutter guard installation. Gutter guards are a protective covering placed over the gutter that allows water to enter but blocks leaves, twigs, and other debris. Installing gutter guards is a "once-and-done" upgrade that will protect your home from all kinds of moisture damage. If you're interested in gutter guard installation for your home, call us today at 1-844-822-2454 or contact us online to get started with an inspection and estimate. We offer free estimates on all our services in Smyrna, Marietta, Athens, Alpharetta, Duluth, Decatur, Kennesaw and the nearby areas. Gutter guards, which are also known as gutter covers, gutter screens, leaf filters, etc., are designed to prevent leaves, twigs and other debris from accumulating in your gutters and impeding water flow. We use high-quality products such as Gutter Love's stainless steel micro-mesh covers. With such a number of options available, which is why it's important to ask these key questions about the gutter guard. Will the gutter guard filter out all kinds of materials? Our patented Mastershield Gutter Protection products are low maintenance, self-cleaning, and will keep out everything, even the smallest debris including shingle grit. Will roof shingles be damaged when the gutter guard is installed? 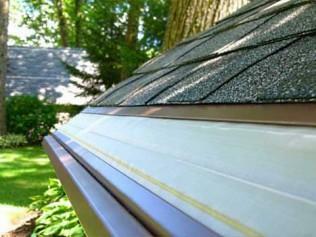 Many gutter covers may be required to be installed under the lower course of roof shingles. When this method is required our professional installers will ensure that this is done properly and will not void any roof warranties. Can leaves accumulate on top of the gutter cover and block water drainage into the gutter? This can be a problem with many screen-type gutter covers, which is why we'll work with you to determine the best type of gutter guard for your home's location to give you ideal performance and limit maintenance and cleaning. Can the gutter cover come loose or be damaged easily? Like any other exterior part of your house, there is always the chance your gutters can be damaged by Mother Nature. However, we use high quality products that will be durable and long-lasting under normal weather patterns. Will the leaf filter look good on my gutters? Gutter guards come in a wide variety of colors, meaning that we can match the guard to your existing gutter to give your home a seamless appearance. If you have issues with clogged gutters or gutters that frequently need to be cleaned, gutter guards could be the solution you need. The gutter installation experts at MasterShield ATL can inspect your home and recommend the right products for your needs. If you're interested in gutter guard installation for your home, call us today at 1-844-822-2454 or contact us online to get started. We offer free estimates on all our work in Roswell, Atlanta, Woodstock, Marietta, Smyrna, Alpharetta, Athens, Kennesaw, Duluth, Decatur, and the nearby areas.